The New York Rangers are a professional ice hockey team based in New York City. They are members of the Metropolitan Division of the Eastern Conference of the National Hockey League (NHL). The team plays its home games at Madison Square Garden in the borough of Manhattan, an arena they share with the New York Knicks of the National Basketball Association (NBA). They are one of three NHL teams located in the New York metropolitan area; the others being the New Jersey Devils and New York Islanders. The Rangers are one of the Original Six, along with the Boston Bruins, Chicago Blackhawks, Detroit Red Wings, Montreal Canadiens and Toronto Maple Leafs, to compete in the NHL until the league's expansion in 1967, after the team was founded in 1926 by Tex Rickard. The team attained success early on under the guidance of Lester Patrick, who coached a vibrant team containing Frank Boucher, Murray Murdoch, and Bun and Bill Cook to Stanley Cup glory in 1928, making them the first NHL franchise in the United States to win the trophy. The team would then go onto win two additional Stanley Cups in 1933 and 1940. Following this initial grace period, the franchise struggled between the 1940s and 1960s, whereby playoff appearances and success was infrequent. The team enjoyed a mini renaissance in the 1970s, where they made the Stanley Cup finals twice, albeit, losing to the Bruins in 1972 and the Canadiens in 1979. The Rangers subsequently embraced a rebuild for much of the 1980s and early 1990s, which eventually paid dividends, where the team, led by Mark Messier, Brian Leetch, Adam Graves, and Mike Richter, captured their fourth Stanley Cup in 1994. The team was unable to duplicate that success in the years that followed, and entered into another period of mediocrity, enduring a franchise-record seven-year postseason drought from 1998 to 2005, and languished for the majority of the 2000s, but reached another Stanley Cup finals in 2014, being led by Martin St. Louis. However, they have since entered into another period of rebuilding. Several former members of the Rangers have been inducted into the Hockey Hall of Fame, four of whom—Buddy O'Connor, Chuck Rayner, Andy Bathgate, and Messier—have won the Hart Memorial Trophy while playing for the team. 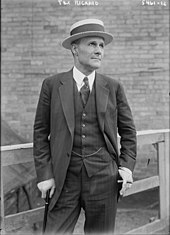 George Lewis "Tex" Rickard, president of Madison Square Garden, was awarded an NHL franchise for the 1926–27 season to compete with the now-defunct New York Americans, who had begun play at the Garden the previous season. The Americans (also known as the "Amerks") proved to be an even greater success than expected during their inaugural season, leading Rickard to pursue a second team for the Garden despite promising the Amerks that they were going to be the only hockey team to play there. The new team was quickly nicknamed "Tex's Rangers". Rickard's franchise began play in the 1926–27 season. The first team crest was a horse sketched in blue carrying a cowboy waving a hockey stick aloft, before being changed to the familiar R-A-N-G-E-R-S in diagonal. Rickard managed to get future legendary Toronto Maple Leafs owner Conn Smythe to assemble the team. However, Smythe had a falling-out with Rickard's hockey man, Col. John S. Hammond, and was fired as manager-coach on the eve of the first season—he was paid a then-hefty $2,500 to leave. Smythe was replaced by Pacific Coast Hockey Association co-founder Lester Patrick. The new team Smythe assembled turned out to be a winner. The Rangers won the American Division title their first year but lost to the Boston Bruins in the playoffs. The team's early success led to players becoming minor celebrities and fixtures in New York City's Roaring Twenties' nightlife. It was also during this time, playing at the Garden on 48th Street, blocks away from Times Square, that the Rangers obtained their now-famous nickname "The Broadway Blueshirts". On December 13, 1929, the New York Rangers became the first team in the NHL to travel by plane when they hired the Curtiss-Wright Corporation to fly them to Toronto for a game against the Toronto Maple Leafs, which they lost 7–6. In only their second season, the Rangers won the Stanley Cup, defeating the Montreal Maroons three games to two. One of the most memorable stories that emerged from the finals involved Patrick playing in goal at the age of 44. At the time, teams were not required to dress a backup goaltender, so when the Rangers' starting goaltender, Lorne Chabot, left a game with an eye injury, Maroons head coach Eddie Gerard vetoed his original choice for a replacement (who was Alex Connell, another NHL goalie of the old Ottawa Senators who was in attendance for the game). An angry Patrick lined up between the pipes for two periods in Game 2 of the finals, allowing one goal to Maroons center Nels Stewart. Frank Boucher scored the game-winning goal in overtime for New York. After a loss to the Bruins in the 1928–29 finals and an early struggle in the early 1930s, the Rangers, led by brothers Bill and Bun Cook on the right and left wings, respectively, and Frank Boucher at center, defeated the Maple Leafs in the 1932–33 best-of-five finals three games to one to win their second Stanley Cup, exacting revenge on the Leafs' "Kid line" of Busher Jackson, Joe Primeau and Charlie Conacher. The Rangers spent the rest of the 1930s playing close to 0.500 hockey until their next Cup win. Lester Patrick stepped down as head coach and was replaced by Frank Boucher. In 1939–40 season, the Rangers finished the regular season in second place behind Boston. The two teams then met in the first round of the playoffs. The Bruins gained a two-games-to-one series lead from New York, but the Rangers recovered to win three-straight games, defeating the first-place Bruins four games to two. The Rangers' first round victory gave them a bye until the finals. The Detroit Red Wings defeated the New York Americans in their first round best-of-three series two games to one (even as the Americans had analytical and notorious ex-Bruins star Eddie Shore), and the Toronto Maple Leafs ousted the Chicago Black Hawks two games to none. The Maple Leafs and Red Wings then played a best-of-three series to determine who played the Rangers in the finals, where Toronto swept Detroit, thus determining the match-up. The 1940 Stanley Cup finals commenced in Madison Square Garden in New York. The first two games went to the Rangers. In Game 1, the Rangers needed overtime to gain a 1–0 series lead, but they won game two more easily with a 6–2 victory. The series then shifted to Toronto, where the Maple Leafs won the next two games, tying the series at two games apiece. In Games 5 and 6, the Rangers won in overtime, taking the series four games to two to earn their third Stanley Cup. However, the Rangers collapsed by the mid-1940s, losing games by as much as 15–0 and having one goaltender post a 6.20 goals against average (GAA). They missed the playoffs for five consecutive seasons before they earned the fourth and final playoff spot in 1948. They lost in the first round and missed the playoffs again in 1948–49 season. In the 1950 Stanley Cup finals, the Rangers were forced to play all of their games on the road (home games in Toronto) while the circus was held at the Garden. They lost to the Detroit Red Wings in overtime in the seventh game of the finals. During this time, Red Wings owner James E. Norris became the largest stockholder in the Garden. However, he did not buy controlling interest in the arena, which would have violated the NHL's rule against one person owning more than one team. Nonetheless, he had enough support on the board to exercise de facto control. The Rangers remained a mark of futility in the NHL for most of the remainder of the Original Six era, missing the playoffs in 12 of the next 16 years. However, the team was rejuvenated in the late 1960s, symbolized by moving into the fourth version of Madison Square Garden in 1968. A year earlier, they made the playoffs for the first time in five years on the strength of rookie goaltender Eddie Giacomin and acquired 1950s Montreal Canadiens star right wing Bernie "Boom Boom" Geoffrion. The Rangers made the finals twice in the 1970s, but lost both times to two '70s powerhouses; in six games to the Boston Bruins in 1972, who were led by such stars as Bobby Orr, Phil Esposito, Ken Hodge, Johnny Bucyk and Wayne Cashman; and in five games to the Canadiens in 1979, who had Bob Gainey, Guy Lafleur, Larry Robinson, Ken Dryden, Guy Lapointe and Serge Savard. By 1971–72, the Rangers reached the Stanley Cup finals despite losing high-scoring center Jean Ratelle (who had been on pace over Bruin Phil Esposito to become the first Ranger since Bryan Hextall in 1942 to lead the NHL in scoring) to injury during the stretch drive of the regular season. The strength of players such as Brad Park, Jean Ratelle, Vic Hadfield and Rod Gilbert (the last three constructing the famed "GAG line", standing for "goal-a-game") carried them through the playoffs. They defeated the defending-champion Canadiens in the first round and the Chicago Black Hawks in the second, but lost to the Bruins in the finals. In the 1972 playoffs, with Ratelle sidelined with a broken ankle and Gilbert hampered by injuries, Walter Tkaczuk played a key role as the Rangers defeated the defending champions Montreal Canadiens, and the previous season's finalists Chicago Black Hawks, to reach the Stanley Cup Finals. While the Rangers lost to the Boston Bruins in six games, Tkaczuk earned much respect for holding the Bruins' Phil Esposito without a goal in the series. The Rangers played a legendary conference semi-final series against the Philadelphia Flyers in the 1973–74 playoffs, losing in seven games and becoming the first of the Original Six teams to lose a playoff series to a 1967 expansion team. This series was noted for a Game 7 fight between Dale Rolfe of the Rangers and Dave Schultz of the Flyers. The Rangers' new rivals, the New York Islanders, who entered the League in 1972 after paying a hefty territorial fee – some $4 million – to the Rangers, were their first round opponents in 1975. After splitting the first two games, the Islanders defeated the more-established Rangers 11 seconds into overtime of the deciding Game 3, establishing a rivalry that continued to grow for years. In a blockbuster trade with Boston, New York acquired Esposito and Carol Vadnais from the Bruins for Park, Ratelle and Joe Zanussi in 1975, while Swedish stars Anders Hedberg and Ulf Nilsson jumped to the Rangers from the League's rival, the World Hockey Association (WHA) in 1978. In the 1979 NHL playoffs, New York then defeated the surging Islanders in the conference semi-finals and returned to the finals again before bowing out to the Canadiens. However, the Islanders got their revenge after eliminating the Rangers in four consecutive playoff series beginning in 1981 en route to their second of four consecutive Stanley Cup titles. The Rangers stayed competitive through the 1980s and early 1990s, making the playoffs each year. In the 1985–86 playoffs, the Rangers, behind the play of rookie goaltender John Vanbiesbrouck, upended the Patrick Division-winning Flyers in five games followed by a six-game win over the Washington Capitals in the Patrick Division finals. Montreal, however, disposed of the Rangers in the Wales Conference finals behind a rookie goaltender of their own, Patrick Roy. The next year, the Rangers acquired superstar center Marcel Dionne after almost 12 years as a Los Angeles King. In 1988, Dionne moved into third place in career goals scored (since bettered by Brett Hull). "Because you love the game so much, you think it will never end", said Dionne, who spent nine games in the minors before retiring in 1989. He played only 49 playoff games in 17 seasons with the Rangers, Kings and Detroit Red Wings. Frustration was at its peak when the 1991–92 squad captured the Presidents' Trophy. They took a 2–1 series lead on the defending champion Pittsburgh Penguins and then faltered in three-straight (some observers note a Ron Francis slapshot from outside the blue line that eluded goaltender Mike Richter as the series' turning point). The following year, injuries and a 1–11 regular season finish landed the Rangers at the bottom of the Patrick Division after being in a playoff position for much of the season. Head coach Roger Neilson did not finish the season. During this period, the Rangers were owned by Gulf+Western, which was renamed to Paramount Communications in 1989, and sold to Viacom in 1994. Viacom then sold the team to ITT Corporation and Cablevision, and a couple of years later, ITT sold their ownership stake to Cablevision, who owned the team until 2010, when they spun off the MSG properties as their own company. The 1993–94 season was a successful one for Rangers fans, as Mike Keenan led the Rangers to their first Stanley Cup championship in 54 years. Two years prior, they picked up center Mark Messier, a part of the Edmonton Oilers' Cup-winning teams. Other ex-Oilers on the Rangers included Adam Graves, Kevin Lowe, Jeff Beukeboom, Esa Tikkanen, Craig MacTavish and Glenn Anderson. Graves set a team record with 52 goals, breaking the prior record of 50 held by Vic Hadfield. The Rangers clinched the Presidents' Trophy by finishing with the best record in the NHL at 52–24–8, setting a franchise record with 112 points earned. The Rangers successfully made it past the first two rounds of the playoffs, sweeping the New York Islanders, and then defeating the Washington Capitals in five games. However, in the conference finals against the third-seeded New Jersey Devils, the Rangers lost the series opener at home in double overtime, but won the next two games before the Devils defeated them 3–1 and 4–1. The series headed back to the Meadowlands for the sixth game, in which Messier scored three times in the final period to lead the Rangers to a 4–2 win and set up a seventh game back at Madison Square Garden. The Rangers won Game 7, 2–1, when Stephane Matteau scored a goal in double overtime, leading the team to the finals for the first time since 1979. Up against the Vancouver Canucks, the Rangers again lost the series opener at home in overtime. The Rangers bounced back and they won the next three games, allowing the Canucks just four goals. However, the Canucks won the next two 6–3 and 4–1 to set up a seventh game, for the second consecutive series, at home. In the seventh game, the Rangers took a 2–0 first period lead, with Messier scoring later to put the Rangers up 3–1, the eventual Cup winning goal as the home team won 3–2, becoming the first (and to this date, the only) player to captain two teams to the Stanley Cup. Brian Leetch became the first American-born player to win the Conn Smythe Trophy as playoff MVP, while Alexander Karpovtsev, Alexei Kovalev, Sergei Nemchinov and Sergei Zubov became the first Russians to have their names engraved on the Cup. Despite having coached the Rangers to a regular season first-place finish and the Stanley Cup, head coach Mike Keenan left after a dispute with general manager Neil Smith. During the 1994–95 lockout-shortened season, the Rangers won their first-round series with the Quebec Nordiques, but lost in the second round of the playoffs to the Philadelphia Flyers in four games with succeeding head coach Colin Campbell. General manager Neil Smith orchestrated a deal that sent Sergei Zubov and center Petr Nedved to Pittsburgh in exchange for defenseman Ulf Samuelsson and left winger Luc Robitaille in the summer of 1995. The next season, the Rangers defeated the Canadiens in six games but lost their second round series to the Penguins in five games. 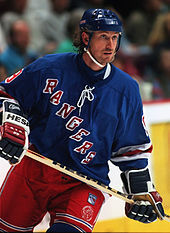 The Rangers then acquired Wayne Gretzky in 1996. Gretzky's greatest accomplishment with the Rangers was leading them to the 1997 Eastern Conference finals, where they lost 4–1 to the Flyers, who were then led by Eric Lindros. Mark Messier, a former Oiler teammate of Gretzky's, left in the summer of 1997 and the team failed in a bid to replace him with Colorado Avalanche superstar Joe Sakic. The Rangers missed the playoffs for seven consecutive seasons, finishing no higher than fourth in their division. In March 2000, Smith was fired along with head coach John Muckler, and that summer, James Dolan hired Glen Sather to replace him. By the end of the 2000–01 season, the Rangers had landed a significant amount of star power. Messier had returned to New York, Theoren Fleury joined the Rangers after spending most of his career with the Calgary Flames and Eric Lindros was traded to the Rangers by the Flyers. The Rangers also acquired Pavel Bure late in the 2001–02 season from the Florida Panthers. It was also the rookie season of goalie Dan Blackburn, who made the NHL All-Rookie Team even as the Rangers fell back to last place in the Conference, and finished out of the playoffs. Later years saw other stars such as Alexei Kovalev, Jaromir Jagr, Martin Rucinsky and Bobby Holik added, but in 2002–03 and 2003–04, the team again missed the playoffs. Blackburn started strongly in 2002–03, but burned out after 17 games. He missed 2003–04 due to mononucleosis and a damaged nerve in his left shoulder. Blackburn could not rehabilitate the damaged nerve, and was forced to retire at the age of 22. Stellar performances by rookie goaltender Henrik Lundqvist during the 2005–06 season led to the Rangers' best record since the 1993–94 season. Towards the end of the 2003–04 season, general manager Glen Sather finally gave in to a rebuilding process by trading away Brian Leetch, Alexei Kovalev, and eight others for numerous prospects and draft picks. With the retirements of Pavel Bure and Mark Messier, as well as Eric Lindros signing with the Toronto Maple Leafs, the post-lockout Rangers, under new head coach Tom Renney, moved away from high-priced veterans towards a group of talented young players, such as Petr Prucha, Dominic Moore and Blair Betts. However, the focus of the team remained on veteran superstar Jaromir Jagr. The Rangers were expected to struggle during the 2005–06 season for their eighth consecutive season out of the post-season. For example, Sports Illustrated declared them the worst team in the League in their season preview, but behind stellar performances by Swedish rookie goaltender Henrik Lundqvist, Martin Straka, Michael Nylander, Prucha, and Jagr, the Rangers finished the season with a record of 44–26–12, their best record since 1993–94. Jagr broke the Rangers' single-season points record with a first-period assist in a 5–1 win against the New York Islanders on March 29, 2006. The assist gave him 110 points on the season, breaking Jean Ratelle's record. Less than two weeks later, on April 8, Jagr scored his 53rd goal of the season against the Boston Bruins, breaking the club record previously held by Adam Graves. Two games prior, on April 4, the Rangers defeated the Philadelphia Flyers 3–2, in a shootout, to clinch a playoff spot for the first time since the 1996–97 season. On April 18, the Rangers lost to the Ottawa Senators 5–1, and, due to wins by Division rivals New Jersey and Philadelphia, the Rangers fell back to third place in the Atlantic division and sixth place in the Eastern Conference to end the season. In the Eastern Conference quarterfinals, the Rangers drew a matchup with the Devils and were defeated in a four-game sweep. In the process, they were outscored 17–4, as New Jersey goaltender Martin Brodeur took two shutouts and a 1.00 GAA to Lundqvist's 4.25. In Game 1 of the series, Jagr suffered an undisclosed injury to his left shoulder, diminishing his usefulness as the series progressed. He missed Game 2 and was back in the lineup for Game 3, though he was held to just one shot on goal. However, on his first shift of Game 4, Jagr re-injured his shoulder and was unable to return for the remainder of the game. Jagr fell two points short of winning his sixth Art Ross Trophy as scoring champion in 2005–06 (the San Jose Sharks' Joe Thornton claimed the award, his first, with 125 points), but Jagr did win his third Pearson Award as the players' choice for the most outstanding player. With the Rangers doing so well in 2005–06, expectations were raised for the 2006–07 season, evidenced by Sports Illustrated then predicting a first-place finish in their division. Realizing that the team had trouble scoring goals in the 2005–06 campaign, the Rangers went out and signed Triple Gold Club winner, 12-time 30-goal scorer, and long-time Detroit Red Wing Brendan Shanahan to a one-year contract. However, the organization remained committed to its rebuilding program despite the signing of the 37-year-old left winger. At the start of the 2006–07 season, Jaromir Jagr was named the Rangers' team captain. On October 5, 2006, opening night of the 2006–07 season, Jagr was named the first team captain since Mark Messier's retirement. 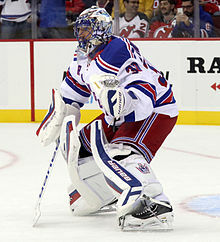 Though the Rangers started a bit slow in the first half of the 2006–07 season, the second half was dominated by the stellar goaltending of Henrik Lundqvist. On February 5, 2007 the Rangers acquired agitating forward Sean Avery in a trade with the Los Angeles Kings. The acquisition of Sean Avery brought new life and intensity to the team. Despite losing several players to injury in March, the Rangers went 10-2-3 in the month of March to move into playoff position, and on April 5 clinched a playoff berth for the second consecutive season with a 3-1 win over the Montreal Canadiens. The Rangers finished the season ahead of the Tampa Bay Lightning and the New York Islanders, finishing in third place in the Atlantic Division and sixth place in the Eastern Conference for the second straight year. Facing the Atlanta Thrashers in the first round of the playoffs, the Rangers swept the series thanks to play from all around the ice. However, the Rangers lost the next round to the Buffalo Sabres by four games to two. At the 2007 NHL Entry Draft, the Rangers chose Alexei Cherepanov 17th overall. Cherepanov had been ranked by the NHL Central Scouting Bureau as the number one European skater and was considered to be a top five pick leading up to the draft, but fell due to teams being unsure whether he would ever come to the NHL from Russia. Despite the departure of Michael Nylander in free agency, the 2007 free agency season started with a bang for the Rangers, with the signing of two high-profile centerman, Scott Gomez from New Jersey on a seven-year contract, as well as Chris Drury from Buffalo on a five-year deal. The moves, along with retaining most other key players, had been met favorably, as the Rangers appeared to be strong Stanley Cup contenders, making the playoffs for the third consecutive season and the second round for the second season in a row. Despite these streaks, however, the Rangers failed to meet expectations, losing their second round series four games to one to the Pittsburgh Penguins. The following off-season saw the departures of captain Jaromir Jagr to the KHL, and alternate captains Martin Straka and Brendan Shanahan, who returned to play in the Czech Republic and with the New Jersey Devils, respectively. Following these departures, Chris Drury was named captain on October 3, 2008. 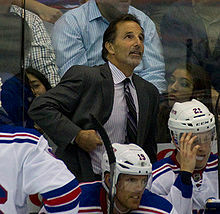 John Tortorella was named the team's head coach in 2009, maintaining the position until 2013. The Rangers were one of four NHL teams to open their 2008–09 season in Europe, being featured in the Victoria Cup final, defeating the European Champions Cup winner Metallurg Magnitogorsk in Bern, Switzerland. The Rangers followed by playing two NHL regular-season games against Tampa Bay in Prague on October 4 and 5, winning both games by 2–1 scorelines. The Rangers tied the 1983–84 Rangers for the best start in franchise history with a 5–0 record, and set the franchise record for best start in a season through the first 13 games by going 10–2–1 for 21 points, with the 10 wins and 21 points each becoming franchise records. A successful start to the season, however, was tempered with by the news of the sudden death of 2007 first-round pick Alexei Cherepanov, which occurred during a KHL game in Russia on October 13, 2008. A disappointing second half of the season followed. After the Rangers went 2-7-3 in their previous 12 games, on February 23, 2009 coach Tom Renney was fired, with 2004 Stanley Cup and Jack Adams Award winner John Tortorella named as his replacement. The Rangers made the 2009 playoffs, but lost their opening round series to the Washington Capitals four games to three after winning the first two games in Washington and having a 3–1 series lead after Game 4. On June 30, 2009 the Rangers traded Scott Gomez, Tom Pyatt, and Michael Busto to the Montreal Canadiens for Chris Higgins, Ryan McDonagh, Pavel Valentenko, and Doug Janik. With Gomez's contract and salary cap hit gone, the Rangers then signed superstar Marian Gaborik on July 1, the first day of free agency. In the 2009–10 season, the Rangers failed to make the playoffs for the first time in five years. There was some criticism that the off-season acquisition of Gaborik, among other top-tier players, had not paid off. However, Gaborik scored 42 goals and 86 points in the season, an impressive return for the team. Despite a strong 8-2 start to the season, the Rangers appeared to play inconsistently with numerous losing streaks. By March 2010, the Rangers were in danger of falling out of the 2010 playoff race entirely, but they registered a respectable 7–1–2 record to finish the season. The final two games of the season were a home-and-home against the Philadelphia Flyers. The first was April 9, 2010, in New York, and the Rangers skated away with the victory, keeping their post-season hopes alive. The final game of the season became the deciding game to determine who would make the playoffs. The Flyers peppered the Rangers goalie Henrik Lundqvist with 47 shots, but scored only once. The game went to a shootout, and the Flyers prevailed to move on to the playoffs despite the strong overall finish to the season by the Rangers. On September 12, 2011, Ryan Callahan was named the 26th captain in Rangers history. 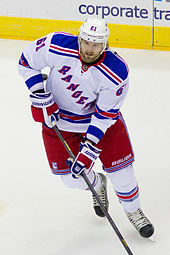 For the 2010–11 season, the Rangers waived defenseman Wade Redden and brought in several players to achieve more balanced scoring. They wore a third jersey for the first time in several years. On November 12, the Rangers unveiled the new Heritage Jersey for the first time at the rink at Rockefeller Center in a special ceremony featuring Rangers alumni and current players discussing the history of the storied franchise. The club wore the jersey for the first time on November 17 when they played the Boston Bruins at Madison Square Garden. The jersey was to be worn every time the Rangers play an Original Six team, or on a Sunday afternoon game at home. The Rangers' fate of making or missing the playoffs came down to the final day of the regular season for the second-straight year. The team defeated the New Jersey Devils on the final day of the season to finish with 93 points on the year. In order to qualify for the 2011 playoffs, however, they needed the Carolina Hurricanes to lose their final game of the season, as Carolina owned the tiebreaker as both teams finished with the same number of points. Carolina lost its final game to Tampa Bay, 6–2, putting the Rangers in the playoffs after missing-out the previous season. The Rangers then faced Washington in the first round. After blowing a 3–0 third period lead in Game 4, with Washington ahead in the best-of-seven series two games to one, the Rangers lost the series in five games. It was the second time in three years that the Capitals eliminated the Rangers from the playoffs. On May 13, 2011, Derek Boogaard, a player whom the Rangers signed the previous off-season for four years, was found dead in his Minnesota apartment. On June 29, 2011 the Rangers bought out captain Chris Drury's contract. On July 2, 2011, Brad Richards, an unrestricted free agent who had played with the Dallas Stars during the prior season, signed a nine-year contract to play for the Rangers. 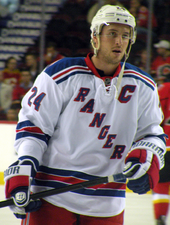 On September 12, 2011, Ryan Callahan was named the 26th captain in the Rangers' history. He became the fifth-youngest captain in team history. Brad Richards and Marc Staal were named alternate captains on the same day. In the 2011–12 season, the Rangers finished as the top seed in the Eastern Conference. Recording 51 wins, 24 regulation losses and seven overtime losses, the team finished with 109 points for the regular season. Their leading scorer for the regular season was Marian Gaborik, who finished the season with 41 goals and 76 points while playing all 82 games. However, the Rangers missed-out on the Presidents' Trophy on the final day of the season to the Vancouver Canucks after a 4–1 loss to Washington. In the first round of the playoffs, the Rangers faced the eighth-seeded Ottawa Senators. After falling behind 3–2 in the series, the Rangers bounced back to win Game 6 in Ottawa as well as the deciding Game 7 at home, propelling them to the conference semi-finals. In the semi-finals, the Rangers faced the Capitals. In Game 3, Gaborik received a pass from Brad Richards to seal a victory 14:41 into the third overtime, giving the Rangers a 2–1 lead in the series. Washington then came back to tie the series 2–2 in Game 4. The Rangers avoided going down 3–2 in the series when Richards tied Game 5 at 2–2 with just 6.6 seconds left in the third period. The goal was scored on a power-play as a result of a high-sticking double-minor committed by Washington's Joel Ward on Rangers' forward Carl Hagelin. Then, in overtime, Rangers defenseman Marc Staal scored on the second penalty of the double-minor just 1:35 into overtime, giving the Rangers a 3–2 series lead. The Rangers went on to win the series 4–3, sending them to the Eastern Conference finals for the first time since 1997. In the conference finals, they faced the New Jersey Devils, a major divisional rival. After leading the series 2-1, the Rangers lost 3 games in a row, losing Game 6 in New Jersey with a goal by Devils forward Adam Henrique at 1:03 in overtime, giving the Devils a 4–2 series win and ending the Rangers' season. On July 23, 2012 the Rangers traded Brandon Dubinsky, Artem Anisimov, Tim Erixon and a 2013 first-round draft pick to the Columbus Blue Jackets in exchange for All-Star Rick Nash, Steven Delisle, and a 2013 conditional third-round pick. At the 2013 NHL trade deadline on April 3, the Rangers then traded Marian Gaborik, Steven Delisle, and Blake Parlett to Columbus for Derick Brassard, Derek Dorsett, John Moore, and a 2014 sixth-round draft pick. After the Rangers were eliminated from the second round of the playoffs by Boston, management fired head coach John Tortorella, and on June 21, 2013, general manager Glen Sather formally introduced ex-Canucks head coach Alain Vigneault as Tortorella's replacement, becoming the 35th head coach in franchise history. The Rangers acquired Rick Nash in a multi-player trade with the Columbus Blue Jackets in 2012. On March 5, 2014, the Rangers traded their captain Ryan Callahan, a first-round draft pick in 2015, a conditional second-round pick in 2014 (which later became a first-round pick), and a conditional seventh-round pick in 2015, for Tampa Bay captain Martin St. Louis and a conditional second-round pick in 2015. The trade occurred in large part after the Rangers and Callahan were unable to reach a contract extension in the days leading up to the deadline. During the regular season, the Rangers won 25 road games, setting a then-franchise record. In the first round of the 2014 playoffs, New York defeated Philadelphia in seven games, and in the next round, the Rangers rallied from a 3–1 series deficit for the first time in their history to defeat Pittsburgh in seven games. They then defeated the Montreal Canadiens in six games to become the Eastern Conference champions, moving on to the Stanley Cup finals for the first time in 20 years. In the finals, they faced the Los Angeles Kings, the Western Conference champions and champions in 2012. The Rangers led the first two games by two goals and eventually fell in overtime, and were then shut-out at home 3–0 in Game 3. The Kings outshot the Rangers in Game 4, but the Rangers staved off elimination by winning the game 2–1 to force a Game 5 in Los Angeles. They had another lead in Game 5, but after the game was tied and subsequently sent to overtime, Kings defenseman Alec Martinez scored with 5:17 left in the second overtime period to win the game for Los Angeles, 3–2, as well as the Stanley Cup. On June 20, 2014, a week after their season ended, the Rangers bought-out the remaining six years of Brad Richards' contract in order to free up salary cap space. This move left Marc Staal and Dan Girardi as the team's remaining alternate captains. On October 6, 2014, defenseman Ryan McDonagh was named the Rangers' 27th captain in team history, with Derek Stepan, Dan Girardi, Marc Staal and Martin St. Louis serving as alternates. In the 2014-15 season the Rangers won the Presidents' Trophy for the third time in franchise history and their seventh division title by finishing with the best record in the NHL at 53–22–7. The 53 wins and 113 points both set franchise records. The division title was the Rangers' first in the Metropolitan Division, which was created during the NHL's realignment in the 2013 off-season. The team won 28 road games in the regular season, breaking the franchise record set the previous season. Over the course of the season the Rangers agreed to terms on a contract extension with Cam Talbot, Marc Staal, and Mats Zuccarello. In the playoffs the Rangers dispatched the Pittsburgh Penguins in five games in the first round. The Rangers then came back from a 3–1 series deficit to win their second-round series against the Capitals in seven games, becoming the first team in NHL history to battle back from a 3–1 deficit in back-to-back seasons and sending the Rangers to the Eastern Conference Final for the third time in four years. However, after winning the first game against the Tampa Bay Lightning, the Rangers lost Game 2 by four goals. The two teams split the first four games of the series, but the Rangers lost Game 5 by a 2–0 scoreline at home, which gave the Lightning an opportunity to clinch the conference finals in Tampa Bay. However, this did not happen in Game 6, as Derick Brassard scored a hat-trick and assisted on two other goals in an emphatic 7–3 Rangers victory to force Game 7 in New York. There, the Lightning shutout the Rangers 2–0, ending the Rangers' season and marking the first occasion the Rangers had ever lost a Game 7 at home in franchise history and the first time they lost an elimination game at home since they lost to Buffalo in 2007. On June 27, 2015 the Rangers traded Carl Hagelin and a pair of draft picks to the Anaheim Ducks for Emerson Etem and a draft pick, Cam Talbot and a draft pick to the Edmonton Oilers for three draft picks, and prospect Ryan Haggerty to the Chicago Blackhawks for Antti Raanta, who was to become the backup goaltender to Lundqvist. Subsequently, on July 1, 2015, Glen Sather resigned as the general manager, with Jeff Gorton taking his place to become the 11th general manager in team history. On July 2, 2015, Martin St. Louis announced his retirement. The team then signed Emerson Etem, and re-signed Oscar Lindberg, Jesper Fast, J. T. Miller, and Derek Stepan. The Rangers started off the 2015–16 season well. After 18 games, they had a 14–2–2 record and a nine-game winning streak, which was eventually halted by Tampa Bay. However, the organization soon went downhill in the winter, losing three-straight games against the Montreal Canadiens, Boston Bruins and Philadelphia Flyers. They eventually posted a 4–7–2 record in December for only ten points. In January the Rangers started playing more efficiently, posting a fair 6–4–1 record, and improved in February by going on a 10–3–1 run without any back-to-back losses. On January 8, 2016 the Rangers traded Emerson Etem to the Vancouver Canucks for Nicklas Jensen and a sixth-round pick in the 2017 NHL draft. On February 28, the Rangers traded prospect Aleksi Saarela, a 2016 second-round draft pick, and a 2017 second-round draft pick for Carolina Hurricanes' captain Eric Staal, who later left the team after the season. The Rangers finished the season with 101 points for back-to-back 100+ point seasons. Despite high hopes, the Rangers were eliminated by the Pittsburgh Penguins in the first round of the 2016 playoffs in five games. On May 2, the Rangers agreed to terms with Antti Raanta on a contract extension, and on May 13, signed Pavel Buchnevich to an entry-level contract. On June 25, 2016 the Rangers acquired Nick Holden from the Colorado Avalanche for a 2017 fourth-round draft pick. Over the course of the summer, the Rangers re-signed J. T. Miller, Chris Kreider, and Kevin Hayes, while Dominic Moore, among others, departed via free agency. On July 18, the Rangers traded their leading scorer Derick Brassard and a 2018 seventh-round draft pick in exchange for Mika Zibanejad and a 2018 second-round draft pick, The team also signed Michael Grabner to a two-year deal and the much-anticipated college sensation Jimmy Vesey to a two-year entry-level contract. The Rangers finished the 2016–17 season in fourth place in the Metropolitan Division with 102 points. In the first round of the playoffs, they won their series with the Montreal Canadiens in six games. In the second game of their second round series with the Ottawa Senators, the Rangers held a two-goal lead on three different occasions, but lost in the second overtime, putting themselves in a 2–0 series deficit. The team responded with consecutive 4–1 home wins in Games 3 and 4 to tie the series at two games apiece. However, in the next two games of the series, the Rangers faltered and were eliminated by the Senators in six games. On June 14, 2017, the Rangers announced a buyout of the remaining three years on Dan Girardi's contract. Just over a week later, the Rangers traded Derek Stepan and Antti Raanta to the Arizona Coyotes in exchange for a first-round draft pick (seventh overall) and former first-round pick Tony DeAngelo. The Rangers' management was also successful in signing top free agent defenseman Kevin Shattenkirk on July 1, 2017, to a four-year deal. The Rangers got off to a slow start and on February 8, 2018, the team was not reaching expectations with a 25–24–5 record and the front office issued a letter to fans essentially announcing the Rangers would be going through a rebuild process. The letter openly stated the team may "lose some familiar faces" and over the next couple of weeks the team shipped Nick Holden to the Bruins for Rob O'Gara and a third-round pick in 2018. The Rangers also traded Michael Grabner to the Devils for a second-round pick in 2018 and prospect Yegor Rykov, and Rick Nash who was traded on the day before the 2018 NHL trade deadline to the Bruins for a 2018 first-round pick, a 2019 seventh-round pick, Matt Beleskey, Ryan Spooner and prospect Ryan Lindgen. The following day, the Rangers traded captain Ryan McDonagh and J. T. Miller to the Tampa Bay Lightning for Vladislav Namestnikov, prospects Brett Howden and Libor Hajek and multiple draft picks. With the team missing the playoffs for the first time since 2010, finishing under .500 for the first time since 2004 and placing last in the Metropolitan Division, head coach Vigneault was fired after the conclusion of the season. On May 23, David Quinn was hired as the team's new head coach. During the off-season, the Rangers re-signed Namestnikov to a two-year deal at the deadline for the free agency on July 1, 2018, and they also signed Fredrik Claesson to a one-year deal the same day. Hayes, Vesey, Brady Skjei and Spooner all had filed for salary arbitration and all of them were re-signed. Hayes received a one-year extension, Vesey and Spooner both received two-year extensions, while Skjei signed a six-year extension. Just one week before the 2018–19 pre-season began, the Rangers traded Steven Kampfer to Boston in exchange for veteran defenseman Adam McQuaid. The classic Rangers sweater has been in use since the franchise's foundation, with several alterations along the way. The current blue uniform has the serifed word "Rangers" in red and white drop shadow arranged diagonally, with red and white stripes on the sleeves and tail. Originally, the uniform was light blue, before it switched to a darker classic Rangers "Broadway Blue" in 1929. In addition, the original versions neither had a drop shadow nor were serifed. During the 1946–47 season, the word "Rangers" was arranged in an arch form above the sweater number. It adopted its current form the next season, along with dropshadowed numbers, except for a brief period where the city name was used, a tie-down collar was not used and the tail and sleeve stripes were separated by thin blue stripes. Red pants have been used with the uniform since the 1929–30 season. The white jerseys were first unveiled in the 1951–52 season, as part of a mandate that regulated NHL teams to have a dark home jersey and a light away jersey. The serifed word "Rangers" is also arranged diagonally, but in blue with red drop shadow. A quinticolor of blue, white and red stripes accentuate the tail and sleeves, while a blue shoulder yoke with white and red stripes completes the look. The white sweaters, with minor changes such as a tie-down collar and arched player names, have remained virtually unchanged since. During the tenure of general manager John Ferguson Sr., he sought to modernize the Rangers sweater by featuring rounded numbers, a darker shade of blue and the shield logo, which was unveiled in the 1976–77 season. A blue and red stripe (white and red stripe in the blue sweaters) extend from the yoke to the sleeves, while blue pants were used. However, it proved unpopular with the fans, and following the 1977–78 season it was replaced by an updated version of their classic uniforms. Ferguson used this similar design when he became GM of the original Winnipeg Jets. From 1998 to 2007 the Rangers' alternate jersey featured the head of the Statue of Liberty with the team abbreviation below it. The modernized classic uniforms introduced in 1978 featured some subtle changes. Both jerseys featured a V-neck collar in a red-white-red pattern, and bolder stripes on the sleeves and waistline. On the blue jersey, the red and white stripes were separated by thin blue stripes, and the waistline stripes were raised above the hemline, so that the patterns on both jerseys matched. From 1978 to 1987, the blue jersey (then the road jersey) featured "NEW YORK" diagonally across the front instead of the traditional "RANGERS" wordmark, similar to their current heritage alternate jerseys. In 1997, the Rangers reverted the blue jersey's design, restoring the old striping pattern, and becoming the first team to re-introduce lace-up collars. The white jerseys followed suit in 1999, and the design was carried over to the Reebok Edge template in 2007. 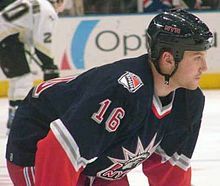 The Rangers previously had a navy alternate jersey featuring the head of the Statue of Liberty with the team abbreviation (NYR) below in a futuristic script. Silver was used as an accent color, but the player names and numbers retain the same color schemes as the regular jerseys, except for a darker shade of blue. With the exception of a white version used in the 1998–99 season, this jersey was used from 1996 to 2007, and proved to be highly popular with fans. During the 2010–11 season, the Rangers debuted a heritage blue jersey as their new alternate uniform. The jersey features a darker shade a blue, as well as a cream trim. Unlike the regular jerseys, the font of the alternate is in sans-serif and does not feature a dropshadow, much like the original Rangers jersey. The Rangers wore the jerseys at home on Saturdays and when they played against Original Six teams. For the 2017–18 season, the heritage jersey was retired because of the league-wide switch to the Adidas uniform format. In the 2012 NHL Winter Classic, the Rangers wore a cream jersey combining classic and current styles. A different version of the shield logo was used, while the player names were arranged in a straight line. The stripes were also lessened, giving it a minimalist, vintage look, as most Winter Classic jerseys are. For the 2014 NHL Stadium Series, the Rangers used white jerseys with the city name in navy, silver and red. In addition, they feature diagonal stripes and sleeve numbers, and enlarged numbers on the back to make them more readable to spectators. The chrome version of the shield logo is placed in the left shoulder. Like the Winter Classic sweaters, player names are in a straight position. The 2018 NHL Winter Classic saw the Rangers wear a navy jersey with a combination of elements from prior uniform designs. The striping design was inspired from their current uniforms, while the white "Rangers" wordmark was a nod from the team's late 1920s jerseys. 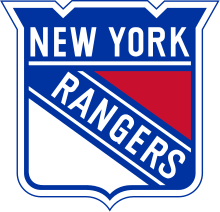 A white silhouette of the Rangers' shield logo contained either the abbreviation "N.Y." or the alternate captain "A" and captain "C" designations. Player names are arranged in a straight position. This is a partial list of the last five seasons completed by the Rangers. For the full season-by-season history, see List of New York Rangers seasons. Brian Leetch was the 21st captain in Rangers history, maintaining the position from 1997 to 2000. The current general manager is Jeff Gorton, who was named on July 1, 2015. The current head coach is David Quinn, who was named on May 23, 2018. The New York Rangers acknowledge an affiliation with a number of inductees to the Hockey Hall of Fame. Rangers inductees include 50 former players and nine builders of the sport. The nine individuals recognized as builders by the Hall of Fame includes former Rangers executives, general managers, head coaches, and owners. In addition to players and builders, several broadcasters were also awarded the Foster Hewitt Memorial Award from the Hockey Hall of Fame. Sal Messina, a color commentator, was the first Rangers broadcaster to be awarded the Foster Hewitt Memorial Award. Other Rangers broadcasters awarded the Foster Hewitt Memorial Award include John Davidson (awarded in 2009), and Sam Rosen (awarded in 2016). Retired numbers hang from the rafters of Madison Square Garden. The Rangers have retired eight numbers for ten players in their history, and the NHL retired Wayne Gretzky's No. 99 for all its member teams at the 2000 NHL All-Star Game. 1 The number was retired in honor of two different players. Playing with the Rangers from 1968 to 1981, Walt Tkaczuk scored the sixth most points in the franchise (678 points). ^ "New York Rangers Directory". NewYorkRangers.com. NHL Enterprises, L.P. Retrieved May 8, 2018. ^ "Rangers Crest" (PDF). 2017–18 New York Rangers Media Guide. NHL Enterprises, L.P. September 20, 2017. Retrieved May 8, 2018. ^ a b Anderson, Dave (May 14, 1995). "Sports of The Times – At Boston Garden, There's Much More Gold Than Green". The New York Times. Retrieved June 17, 2008. ^ Goldman, Shayna (August 15, 2018). "A Timeline of the New York Rangers Rebuild". Blueshirt Banter. Retrieved February 12, 2019. ^ Boland Jr., Ed (February 16, 2003). "F.Y.I." The New York Times. Retrieved June 17, 2008. ^ Boucher, Frank; Frayne, Trent (1973). When the Rangers Were Young. New York: Dodd, Mead & Company. p. 74. ISBN 0-396-06852-9. LCCN 73007485. OCLC 799524. OL 5415647M. Even before our training camp opened we were widely known as Tex's Rangers, a name given us by George Daley, the sports editor of the New York Herald Tribune, and one that seemed likely to stick. In fact, our first team crest was that of a horse sketched in blue carrying a cowboy waving a hockey stick aloft. The horse was rearing, with the word TEX'S in a crescent at the top of the emblem with RANGERS looped below. But Rickard didn't like the idea and before the season opened our insignia was changed to the present diagonal splash of the word RANGERS. ^ Anderson, Dave (May 15, 1994). "Sports of The Times; The Original Ranger, Murray Murdoch, Turns 90". The New York Times. Retrieved June 17, 2008. ^ "NHL Standings". The Internet Hockey Database. Retrieved June 17, 2008. ^ "1926–27 NHL Playoff Results". The Internet Hockey Database. Retrieved June 17, 2008. ^ "Stanley Cup history". USA Today. June 14, 2002. Retrieved June 17, 2008. ^ "Team History". New York Rangers. Archived from the original on April 11, 2008. Retrieved June 17, 2008. ^ Sielski, Mike (April 26, 2014). "Schultz vs. Rolfe: Fight resonates 40 years later". Philadelphia Inquirer. Retrieved March 28, 2015. ^ Craig Wolff (March 11, 1987). "Rangers Get Kings' Dionne". The New York Times. Retrieved March 28, 2015. ^ Kay, Jason (December 31, 2013). "Greatest Teams of All-Time: 1991–92 Pittsburgh Penguins". The Hockey News. Retrieved April 1, 2015. ^ Bondy, Filip (May 10, 1992). "Hockey – Rangers Squander Lead and Lose". The New York Times. Retrieved April 1, 2015. ^ Vecsey, George (June 24, 1994). "Sports of The Times; Houston Finally Has an Edge". The New York Times. Retrieved June 17, 2008. ^ "Caps spoil Rangers' chance to claim Presidents' Trophy". CBS Sports. April 7, 2012. Retrieved April 1, 2015. ^ Morrison, Scott (2008). Hockey Night in Canada: My Greatest Day. Toronto: Key Porter Books. pp. 106–109. ISBN 978-1-55470-086-8. ^ Popplewell, Brett (October 10, 2014). "How Messier emerged from Gretzky's shadow". Sportsnet. Retrieved April 1, 2015. ^ Rappaport, Michael (November 21, 2012). "Brian Leetch: The Road to the 1994 Conn Smythe Trophy Part One". The Hockey Writers. Retrieved March 28, 2015. ^ Vecsey, George (June 15, 1994). "Stanley Cup Finals – Russian Rangers Say Nyet to Possible Defeat". The New York Times. Retrieved April 1, 2015. ^ The Hockey Rodent (February 9, 2004). "The Curse". Retrieved August 8, 2007. ^ "Rangers Hire Sather". CBS News. Associated Press. May 31, 2000. Retrieved August 8, 2007. ^ "Theo Fleury signs with Rangers". Associated Press. July 8, 1999. Retrieved August 8, 2007. ^ "Lindros joins Rangers nine years after first trade". CNN. Associated Press. August 24, 2001. Retrieved August 8, 2007. ^ Allen, Kevin (March 19, 2002). "Panthers trade Pavel Bure to Rangers". USA Today. Retrieved August 8, 2007. ^ "Dan Blackburn Selected to 2001–02 NHL All-Rookie Team" (Press release). New York Rangers. June 20, 2002. Archived from the original on May 9, 2006. Retrieved January 5, 2012. ^ "Dan Blackburn to Retire" (Press release). New York Rangers. May 25, 2005. Archived from the original on May 9, 2006. Retrieved January 5, 2012. ^ Kennedy, Kostya (October 3, 2005). "Sports Illustrated's NHL Preview – New York Rangers". Sports Illustrated. Retrieved August 8, 2007. ^ "Box Score – Rangers 5, Islanders 1". March 29, 2006. Archived from the original on April 17, 2007. Retrieved August 8, 2007. ^ "Game Notes – Rangers 5, Islanders 1". March 29, 2006. Archived from the original on September 29, 2007. Retrieved August 8, 2007. ^ "Game Notes – Rangers 4, Boston Bruins 3 (OT)". April 8, 2006. Archived from the original on September 26, 2007. Retrieved August 8, 2007. ^ "Game Notes – Rangers 3, Philadelphia Flyers 2 (SO)". April 4, 2006. Archived from the original on September 29, 2007. Retrieved August 8, 2007. ^ "Game Notes – Rangers 1, Ottawa Senators 5". April 18, 2006. Archived from the original on September 29, 2007. Retrieved August 8, 2007. ^ "SI's 2006–07 NHL Preview: Atlantic Division". Sports Illustrated. September 25, 2006. Retrieved August 8, 2007. ^ Silverstein, Dubi (July 27, 2007). "Rangers Rebuild While Winning". Blueshirt Bulletin. Archived from the original on September 27, 2007. Retrieved August 8, 2007. ^ "Jagr named 24th captain in Rangers history" (Press release). New York Rangers. October 5, 2006. Archived from the original on November 25, 2006. Retrieved January 5, 2012. ^ Weinman, Sam (June 27, 2007). "Rangers have high hopes for top pick Cherepanov". The Journal News. Archived from the original on May 14, 2014. Retrieved August 8, 2007. ^ Weinman, Sam (July 2, 2007). "Rangers sign top tier centers Drury, Gomez". The Journal News. Archived from the original on January 21, 2015. Retrieved August 8, 2007. ^ Greenstein, Kevin (August 16, 2007). "Peca Would Complete Renovation of Ranger Offense". The New York Sun. Retrieved August 16, 2007. ^ Brooks, Larry (November 6, 2008). "Rangers Seek Pick for Late Prospect Cherpanov". New York Post. Retrieved July 24, 2009. ^ "NHL notes: Renney rendered by Rangers". Journal Star news services. February 23, 2009. Retrieved January 6, 2011. ^ "New York Rangers enforcer Derek Boogaard found dead at 28". Archived from the original on May 18, 2011. Retrieved May 16, 2011. ^ Brooks, Larry (July 2, 2011). "Rangers sign Richards to nine-year, $58.5M contract". New York Post. Retrieved October 25, 2011. ^ Klein, Jeff Z.; Belson, Ken (September 12, 2011). "Callahan Fills Drury's Role as Captain of Rangers". The New York Times. Retrieved April 1, 2015. ^ Urtz Jr., Tom (September 20, 2011). "New York Rangers: Where Could Ryan Callahan Rank in Lineage of Ranger Captains?". Bleacher Report. Retrieved April 1, 2015. ^ Lozo, Dave (July 23, 2012). "Nash traded to Rangers in five-player deal". National Hockey League. Retrieved March 9, 2015. ^ Strang, Katie (April 3, 2013). "Rangers trade Marian Gaborik". ESPNNewYork.com. Retrieved March 9, 2015. ^ Podell, Ira (June 22, 2013). "Rangers hire new coach Vigneault with 5-year deal". CBC.com. Associated Press. Retrieved June 9, 2014. ^ "Los Angeles Kings win Stanley Cup in thriller". CNN. June 14, 2014. Retrieved July 8, 2014. ^ "Brad Richards bought out by Rangers – NHL on CBC Sports – Hockey news, opinion, scores, stats, standings". Canadian Broadcasting Corporation. Retrieved July 8, 2014. ^ "Brassard, Rangers down Lightning to force game seven". National Hockey League. Retrieved May 26, 2015. ^ "Lightning defeat Rangers, advance to Cup Final". National Hockey League. Retrieved May 29, 2015. ^ Brooks, Larry (June 27, 2015). "Rangers trade Cam Talbot and Carl Hagelin". New York Post. Retrieved February 9, 2017. ^ "Trades completed during 2015 NHL Draft weekend". National Hockey League. June 27, 2015. Retrieved February 9, 2017. ^ "Jeff Gorton Named 11th General Manager in Franchise History". National Hockey League. July 1, 2015. Retrieved July 3, 2017. ^ Whyno, Stephen (July 2, 2015). "Martin St. Louis retires from NHL". CBC Sports. The Canadian Press. Retrieved February 9, 2017. ^ Leonard, Pat (July 16, 2015). "With Derek Stepan awaiting new deal, Rangers re-sign Jesper Fast, J.T. Miller". Daily News. New York. Retrieved February 9, 2017. ^ Leonard, Pat (July 16, 2015). "Derek Stepan re-signs with Rangers on $39 million deal". Daily News. New York. Retrieved February 9, 2017. ^ Gretz, Adam (July 27, 2015). "Rangers sign Derek Stepan to 6-year, $39 million contract". CBSSports.com. Retrieved February 9, 2017. ^ "Rangers acquire Staal from Hurricanes". The Sports Network. February 28, 2016. Retrieved February 9, 2017. ^ "Wild Agrees To Terms With Eric Staal on a Three-Year Deal". National Hockey League. July 1, 2016. Retrieved February 9, 2017. ^ "Rangers Agree to Terms With Antti Raanta". National Hockey League. May 2, 2016. Retrieved February 9, 2017. ^ "Rangers Agree to Terms With Forward Pavel Buchnevich". National Hockey League. May 13, 2016. Retrieved February 9, 2017. ^ "Bruins Sign Dominic Moore, Chris Casto, Brian Ferlin And Alex Grant To One-Year Contracts". National Hockey League. August 30, 2016. Retrieved February 9, 2017. ^ "Rangers Acquire Forward Mika Zibanejad". National Hockey League. July 18, 2016. Retrieved February 9, 2017. ^ Leonard, Pat (July 1, 2016). "Rangers hit the discount rack and sign free agents Michael Grabner and Nathan Gerbe". Daily News. New York. Retrieved February 9, 2017. ^ Kreda, Allan (August 19, 2016). "Rangers Sign Jimmy Vesey, Coveted by Much of the N.H.L." The New York Times. Retrieved February 9, 2017. ^ Kreda, Allan (June 14, 2017). "Rangers Are Buying Out Dan Girardi's Contract". The New York Times. Retrieved May 10, 2018. ^ Kreda, Allan (June 23, 2017). "Rangers Trade Derek Stepan to Coyotes Ahead of N.H.L. Draft". The New York Times. Retrieved May 10, 2018. ^ "Rangers sign top free agent Kevin Shattenkirk". ESPN. July 1, 2017. Retrieved May 10, 2018. ^ Bailey, Jason M. (April 8, 2018). "Rangers Fire Alain Vigneault After Rare Playoff-Less Season". The New York Times. Retrieved April 9, 2018. ^ a b "Rangers hire Boston University's David Quinn as coach". AP News. May 23, 2018. Retrieved May 23, 2018. ^ Urtz Jr., Tom (July 1, 2018). "Vladislav Namestnikov Signs Two-Year Deal Worth $8 Million, $4 Million Annually". Retrieved July 6, 2018. ^ "Rangers Agree to Terms With Free Agent Defenseman Fredrik Claesson". NHL.com. July 1, 2018. Retrieved November 9, 2018. ^ "Rangers Agree to Terms With Brady Skjei". NHL.com. July 28, 2018. Retrieved November 9, 2018. ^ "Rangers Acquire Adam McQuaid". September 11, 2018. Retrieved November 7, 2018. ^ a b c "New York Rangers uniform history". The (unofficial) NHL Uniform Database. Retrieved May 10, 2014. ^ "1976–77 New York Rangers uniforms". The (unofficial) NHL Uniform Database. Retrieved May 10, 2014. ^ "1978–87 New York Rangers uniforms". The (unofficial) NHL Uniform Database. Retrieved June 9, 2014. ^ "1997–98 New York Rangers uniforms". The (unofficial) NHL Uniform Database. Retrieved June 9, 2014. ^ "1999–2007 New York Rangers uniforms". The (unofficial) NHL Uniform Database. Retrieved June 9, 2014. ^ "1996–97 New York Rangers uniforms". The (unofficial) NHL Uniform Database. Retrieved May 10, 2014. ^ "2011–12 New York Rangers uniforms". The (unofficial) NHL Uniform Database. Retrieved May 10, 2014. ^ "2013–14 New York Rangers uniforms". The (unofficial) NHL Uniform Database. Retrieved May 10, 2014. ^ "2017–18 New York Rangers uniforms". The (unofficial) NHL Uniform Database. Retrieved November 4, 2018. ^ "New York Rangers Roster". NHL.com. Retrieved September 28, 2018. ^ "New York Rangers Hockey Transactions". TSN.ca. Retrieved October 3, 2017. ^ "Rangers Records – Captains". Archived from the original on January 30, 2008. Retrieved November 27, 2007. ^ Calamia, Matt (July 1, 2015). "Jeff Gorton Named 11th General Manager in Franchise History". National Hockey League. Archived from the original on July 3, 2015. Retrieved July 1, 2015. ^ "Andy Hebenton's profile at hockeydb.com". Retrieved August 10, 2007. ^ a b "Non-NHL Trophies - Lester Patrick Trophy". Legends of Hockey. Retrieved April 17, 2018. ^ "Terry Sawchuk – Career Statistics". Archived from the original on September 29, 2007. Retrieved August 10, 2007. ^ "Emile Francis – Biography". Archived from the original on September 29, 2007. Retrieved August 10, 2007. ^ "Frank Boucher – Biography". Archived from the original on September 29, 2007. Retrieved August 10, 2007. ^ "Brian Patrick Mullen". Archived from the original on September 29, 2007. Retrieved August 10, 2007. ^ "Herb Brooks – Biography". Archived from the original on September 29, 2007. Retrieved August 10, 2007. ^ Podell, Ira (November 7, 2007). "Leetch, Cammi Granato among 4 winners of Lester Patrick Award". Associated Press. Retrieved November 19, 2007. ^ "NHL Plus Minus Award Winners". Archived from the original on September 16, 2007. Retrieved November 19, 2007. ^ a b c Rosasco, John; Rappaport, Michael; Hayes, Lindsay; Nissan, Ryan, eds. (2017). "Hall of Fame Selections" (PDF). 2017–18 New York Rangers Media Guide. New York Rangers. p. 382. Retrieved May 8, 2018. ^ Dellapina, John (September 6, 2007). "Leetch's number headed for Garden rafters". Daily News. New York. Retrieved December 4, 2007. ^ a b "Rangers raise No. 3, No. 9 to rafters". ESPN. February 22, 2009. Retrieved May 10, 2018. ^ Stephenson, Colin (February 3, 2009). "New York Rangers retire Adam Graves' No. 9 before losing to Atlanta in shootout". The Star-Ledger. Retrieved May 10, 2018. ^ Stubbs, Dave (December 2, 2018). "Hadfield's No. 11 retired by Rangers". NHL.com. Retrieved December 3, 2018. ^ "Rangers hoist Messier's No. 11 to Garden rafters". Associated Press. January 13, 2006. Retrieved December 4, 2007. ^ Kreda, Allan (February 24, 2018). "Rangers Greats Reunite to Honor Jean Ratelle". The New York Times. Retrieved February 24, 2018. ^ "Goalie won 301 games with New York". Associated Press. February 5, 2004. Retrieved December 4, 2007. ^ a b c d e f g h i j k "Players – New York Rangers – All Skaters – Rookie + Veteran – All-Time – All Countries – Available Provinces/States – Shoots Left or Right – All Draft Years – All Draft Rounds – 1917-1918 To 2017-2018 – Regular Season – Skater Summary – National Hockey League.com – Stats". National Hockey League. Retrieved November 25, 2017. ^ a b c d "Players – New York Rangers – All Skaters – Rookie + Veteran – All-Time – All Countries – Available Provinces/States – Shoots Left or Right – All Draft Years – All Draft Rounds – 1917-1918 To 2017-2018 – Regular Season – Points by Type (since 1933-34) – National Hockey League.com – Stats". National Hockey League. Retrieved November 25, 2017. ^ a b "Players – New York Rangers – All Skaters – Rookie + Veteran – All-Time – All Countries – Available Provinces/States – Shoots Left or Right – All Draft Years – All Draft Rounds – 1917-1918 To 2017-2018 – Regular Season – Goals by Type (since 1933-34) – National Hockey League.com – Stats". National Hockey League. Retrieved November 25, 2017. ^ a b "Players – New York Rangers – Rookie + Veteran – All-Time – All Countries – Available Provinces/States – Catches Left or Right – All Draft Years – All Draft Rounds – 1917-1918 To 2017-2018 – Regular Season – Goalie Summary – National Hockey League.com – Stats". National Hockey League. Retrieved November 25, 2017. ^ "Players – New York Rangers – All Skaters – Rookie + Veteran – All-Time – All Countries – Available Provinces/States – Shoots Left or Right – All Draft Years – All Draft Rounds – 1917-1918 To 2017-2018 – Regular Season – Skater Summary – Sum Results – National Hockey League.com – Stats". National Hockey League. Retrieved November 25, 2017. Boucher, Frank; Frayne, Trent (1973). When The Rangers Were Young. New York: Dodd, Mead & Company. ISBN 0-396-06852-9. Kreiser, John; Friedman, Lou (1997). The New York Rangers: Broadway's Longest Running Hit. ISBN 1-57167-041-6. Wikimedia Commons has media related to New York Rangers.